In essence, an Elasticsearch index is mapped to a Cassandra keyspace, and a document type to a Cassandra table. long time Existing Cassandra time columns (64-bit signed integer representing the number of nanoseconds since midnight) stored as long in Elasticsearch. keyword uuid Existing Cassandra uuid columns are mapped to an Elasticsearch keyword. keyword or date timeuuid Existing Cassandra timeuuid columns are mapped to an Elasticsearch keyword by default, or can explicitly be mapped to an Elasticsearch date. object, nested Custom User Defined Type User Defined Type should be frozen, as described in the Cassandra documentation. Geo shapes require _source to be enabled to store the original JSON document (default is disabled). Existing Cassandra text columns containing a geohash string can be mapped to an Elasticsearch geo_point. Theses parameters below control the Cassandra mapping. cql_collection list, set or singleton Control how the field of type X is mapped to a column list<X>, set<X> or X. Default is list because Elasticsearch fields are multivalued. cql_struct udt or map Control how an object or nested field is mapped to a User Defined Type or to a Cassandra map<text,?>. Default is udt. cql_static_column true or false When true, the underlying CQL column is static. Default is false. cql_primary_key_order integer Field position in the Cassandra the primary key of the underlying Cassandra table. Default is -1 meaning that the field is not part of the Cassandra primary key. cql_partition_key true or false When the cql_primary_key_order >= 0, specify if the field is part of the Cassandra partition key. Default is false meaning that the field is not part of the Cassandra partition key. cql_clustering_key_desc true or false Indicates if the field is a clustering key in ascending or descending order, default is ascending. See Cassandra documentation about clustering key ordering. cql_type <CQL type> Specify the Cassandra type to use to store an elasticsearch field. By default, this is automatically set depending on the Elasticsearch field type, but in some situation, you can overwrite the default type by another one. For more information about Cassandra collection types and compound primary key, see CQL Collections and Compound keys. For every update, Elassandra reads for missing fields in order to build a full Elasticsearch document. If some fields are backed by Cassandra collections (map, set or list), Elassandra force a read before index even if all fields are provided in the Cassandra upsert operation. For this reason, when you don’t need multi-valued fields, use fields backed by native Cassandra types rather than the default list to avoid a read-before-index when inserting a row containing all its mandatory elasticsearch fields. Elassandra supports the Elasticsearch Indice API and automatically creates the underlying Cassandra keyspaces and tables. For each Elasticsearch document type, a Cassandra table is created to reflect the Elasticsearch mapping. However, deleting an index does not remove the underlying keyspace, it only removes the Cassandra secondary indices associated to the mapped columns. Additionally, with the new put mapping parameter discover, Elassandra creates or updates the Elasticsearch mapping for an existing Cassandra table. Columns matching the provided regular expression are mapped as Elasticsearch fields. The following command creates the Elasticsearch mapping for all columns starting with a ‘a’ in the Cassandra table my_keyspace.my_table and set a specific analyser for column name. By default, all text columns are mapped with "type":"keyword". When creating the first Elasticsearch index for a given Cassandra table, Elassandra creates a custom CQL secondary index. Cassandra automatically builds indices on all nodes for all existing data. Subsequent CQL inserts or updates are automatically indexed in Elasticsearch. rebuild_index reindexes SSTables from disk, but not from MEMtables. In order to index the very last inserted document, run a nodetool flush <kespace_name> before rebuilding your Elasticsearch indices. When deleting an elasticsearch index, elasticsearch index files are removed from the data/elasticsearch.data directory, but the Cassandra secondary index remains in the CQL schema until the last associated elasticsearch index is removed. Cassandra is acting as primary data storage, so keyspace and tables and data are never removed when deleting an elasticsearch index. _index is the index name mapped to the underlying Cassandra keyspace name (dash [-] and dot[.] are automatically replaced by underscore [_]). _type is the document type name mapped to the underlying Cassandra table name (dash [-] and dot[.] are automatically replaced by underscore [_]). Since Elasticsearch 6.x, there is only one type per index. _id is the document ID is a string representation of the primary key of the underlying Cassandra table. Single field primary key is converted to a string, compound primary key is converted into a JSON array converted to a string. For example, if your primary key is a string and a number, you will get _id = [“003011FAEF2E”,1493502420000]. To get such a document by its _id, you need to properly escape brackets and double-quotes as shown below. _source is the indexed JSON document. By default, _source is disabled in Elassandra, meaning that _source is rebuild from the underlying Cassandra columns. If _source is enabled (see Mapping _source field) ELassandra stores documents indexed by with the Elasticsearch API in a dedicated Cassandra text column named _source. This allows to retreive the orginal JSON document for GeoShape Query. _routing is valued with a string representation of the partition key of the underlying Cassandra table. Single partition key is converted into a string, compound partition key is converted into a JSON array. Specifying _routing on get, index or delete operations is useless, since the partition key is included in _id. 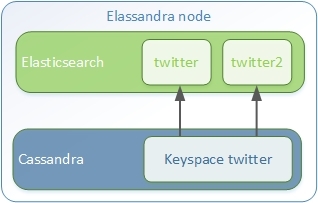 On search operations, Elassandra computes the Cassandra token associated with _routing for the search type, and reduces the search only to a Cassandra node hosting the token. (WARNING: Without any search types, Elassandra cannot compute the Cassandra token and returns with an error all shards failed). _ttl and _timestamp are mapped to the Cassandra TTL and WRITIME in Elassandra 5.x. The returned _ttl and _timestamp for a document will be the one of a regular Cassandra column if there is one in the underlying table. Moreover, when indexing a document through the Elasticsearch API, all Cassandra cells carry the same WRITETIME and TTL, but this could be different when upserting some cells using CQL. _parent is string representation of the parent document primary key. If the parent document primary key is composite, this is string representation of columns defined by cql_parent_pk in the mapping. See Parent-Child Relationship. _token is a meta-field introduced by Elassandra, valued with token(<partition_key>). _node is an optional meta-field introduced by Elassandra, valued with the Cassandra host id, allowing to check the datacenter consistency. You can map several Elasticsearch indices with different mappings to the same Cassandra keyspace. By default, an index is mapped to a keyspace with the same name, but you can specify a target keyspace in your index settings. For example, you can create a new index twitter2 mapped to the Cassandra keyspace twitter and set a mapping for the type tweet associated to the existing Cassandra table twitter.tweet. You can set a specific mapping for twitter2 and re-index existing data on each Cassandra node with the following command (indices are named elastic_<tablename>_idx). By default, rebuild_index uses only one thread, but Elassandra supports multi-threaded index rebuild with the new parameter –threads. Index name is <elastic>_<table_name>_idx where column_name is any indexed column name. Once your twitter2 index is ready, set an alias twitter for twitter2 to switch from the old mapping to the new one, and delete the old twitter index. Elasticsearch TTL support is deprecated since Elasticsearch 2.0 and the Elasticsearch TTLService is disabled in Elassandra. Rather than periodically looking for expired documents, Elassandra supports partitioned index allowing managing per time-frame indices. Thus, old data can be removed by simply deleting old indices. Partitioned index also allows indexing more than 2^31 documents on a node (2^31 is the lucene max documents per index). 1 to N document field names. StringFormatPartitionFunction (the default) based on the JDK function String.format(Locale locale, <parttern>,<arg1>,…). MessageFormatPartitionFunction based on the JDK function MessageFormat.format(<parttern>,<arg1>,…). Index partition function are stored in a map, so a given index function is executed exactly once for all mapped index. For example, the toYearIndex function generates the target index logs_<year> depending on the value of the date_field for each document (or row). You can define each per-year index as follow, with the same index.partition_function for all logs_<year>. All these indices will be mapped to the keyspace logs, and all columns of the table mylog automatically mapped to the document type mylog. Partition function is executed for each indexed document, so if write throughput is a concern, you should choose an efficient implementation class. How To remove an old index. Cassandra TTL can be used in conjunction with partitioned index to automatically removed rows during the normal Cassandra compaction and repair processes when index_on_compaction is true, however it introduces a Lucene merge overhead because the document are re-indexed when compacting. You can also use the DateTieredCompactionStrategy to the TimeWindowTieredCompactionStrategy to improve performance of time series-like workloads. By default, Elasticsearch Object or nested types are mapped to dynamically created Cassandra User Defined Types. The resulting Cassandra user defined types and table. By default, nested document are be mapped to User Defined Type. You can also use a CQL map having a text key and value is a native or UDT type (using a collection in a map is not supported). Thus, each new key in the map invlove an Elasticsearch mapping update to declare the key as a new field. Obivously, don’t use such mapping when keys are versatile. In the following example, each new key entry in the map attrs is mapped as field. Create the type mapping from the Cassandra table and search for the bob entry. Now insert a new entry in the attrs map column and search for a nested field attrs.city:paris . Dynamic templates can be used when creating a dynamic field from a Cassandra map. Note that because doc_values is true by default for a keyword field, it does not appear in the mapping. when the parent and child documents share the same Cassandra partition key, as shown in the following example. Create an index company (a Cassandra keyspace), a Cassandra table, insert 2 rows and map this table as document type employee. Search for documents having children document of type employee with dob date greater than 1980. Search for employee documents having a parent document where country match UK. When a Cassandra table has one or more clustering columns, a static columns is shared by all the rows with the same partition key. Each time a static columns is modified, a document containing the partition key and only static columns is indexed in Elasticserach. By default, static columns are not indexed with every wide rows because any update on a static column would requires reindexation of all wide rows. However, you can request for fields backed by a static column on any get/search request. The following example demonstrates how to use static columns to store meta information of a timeserie. Search for wide rows only where v=10 and fetch the meta.region field. Search for rows where meta.region=west, returns only a static document (i.e. document containing the partition key and static columns) because index_static_document is true. index_static_document controls whether or not static document (i.e. document containing the partition key and static columns) are indexed (default is false). index_static_only if true, it only indexes static documents with partition key as _id and static columns as fields. index_static_columns controls whether or not static columns are included in the indexed documents (default is false). Be careful, if index_static_document = false and index_static_only = true, it will not index any document. In our example with the following mapping, static columns are indexed in every document, allowing to search on. When dynamic mapping is disabled and a mapping type has no indexed field, elassandra nodes can act as a JSON-REST gateway for Cassandra to get, set or delete a Cassandra row without any indexing overhead. In this case, the mapping may be use to cast types or format date fields, as shown below. As a result, you can index, get or delete a Cassandra row, including any column from your Cassandra table. First, create a named pipeline as show below. This pipeline adds a new timeuuid field based on the existing date field es_time using the date format ISO8601 in europ timezone. The second processor set the document _id to a JSON compound key including the field kubernetes.docker_id (as the Cassandra partition key) and ts as a clustering key with CQL type timeuuid. Because timeuuid is not an Elasticsearch type, this CQL type must be explicit in the Elasticsearch mapping using the cql_type field mapping attribute to replace the default timestamp by timeuuid. This can be acheived with an elasticsearch template. Your mapping must also defines a Cassandra partition key as text, and a clustering key of type timeuuid. When the index.include_node = true (default is false), the _node metafield containing the Cassandra host id is included in every indexed document. This allows distinguishing multiple copies of a document when the datacenter replication factor is greater than one. Then a token range aggregation allows counting the number of documents for each token range and for each Cassandra node. In the following example, we have 1000 accounts documents in a keyspace with RF=2 in a two nodes datacenter, with each token ranges having the same number of document for the two nodes. Please note that according to your use case, you should add a filter to your query to ignore write operations occurring during the check.